The Black Poisonwood tree (Metopium Brownie or Metopium Toxiferum of the family Anacardiaceae) is also known as Chechen, Chechem (Mayan name), Coral Sumac, Caribbean Rosewood, and Cedro Prieto. It is found throughout Central America, the Caribbean and the West Indies. This tree produces beautiful decorative wood used for carving, wood turning, furniture etc. But it has a very powerful defense mechanism against people! This form of defense is a highly irritating sap, and when human skin comes in contact with it, the result can be quite an ordeal. 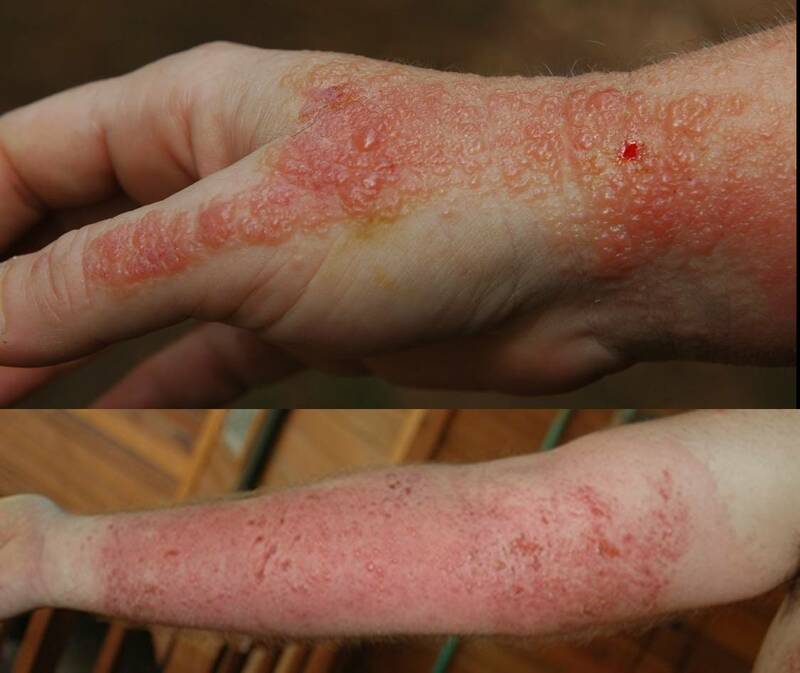 It starts with a redness, (like a bad rash similar to poison ivy, poison sumac, poison oak and the rest of them…) but often will develop into itchy and burning blisters, and is extremely painful. Depending on the amount of sap and how quickly you treat it, it can remain a rash and be gone in just a few days, or it can develop into a 1st to 2nd degree burn(s). Plus another interesting thing, in my husband’s case, nothing major happen for 3 days, but then on the fourth day he was covered! When you scratch (and you will) and then touch another part of your body (or someone else’s), the infection can easily spread. The picture below is of a hand (mine) and an infected arm (my husband’s) with blisters. The pictures are not that bad, but for the squeamish, you may not want to click it! That was extremelly painful and lasted for a few weeks. To get it that bad is rather rare though. Usually you only touch the bark of the tree and hopefully treat it immediately. It is then a mild rash and in a very limited area. In that particular case, we did cut lots of trees, which means that the sap was also in the air, landing all over our clothes and body. It was also a very warm day and we were sweating a lot… perfect way to spread it all over your body! 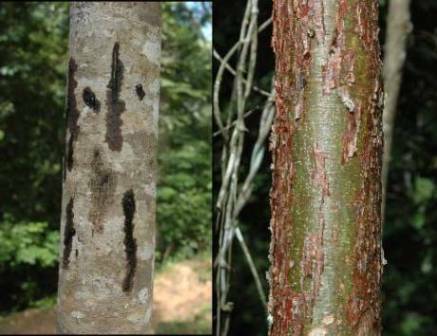 Pictured on the left below is the bark of the Black Poisonwood tree. The black stuff (the sap comes out of the tree clear, but upon being introduced to oxygen it then turns black), which actually looks a lot like tar, is the poison. You do not want to touch this tree at all, but especially the black spots. The leaves of the tree can also be toxic. Now even after the tree is chopped down and dried… it still can be just as potent. In the saw mills when cutting the wood, the dust can have the same burning affect. Or even when you are just burning off a pile of old logs, the smoke can also spread the poison. Pictured on the right is the Gumbo Limbo tree (Bursera Simaruba of the family Burseraceae), which is the natural antidote of the Black Poisonwood. The tree sap relieves rashes, stings and burns. A medicinal tree, tea from its leaves is use to treat fever, low blood pressure. Gumbo Limbo trees grow in the same area of the Black Poisonwood trees. If you have touched the Black Poisonwood, the first thing to do is to find a Gumbo Limbo tree. And as soon as possible you must wash the area very well with any oil dissolving substance as just water and regular soap will not remove all of it (I have also read somewhere that WD40 can be quite effective). You cut a piece of the Gumbo Limbo bark and wipe the inside on the affected area. Hang on to this bark and reapply several times early on. What you can also do is boil the bark, add powdered vitamin C to the boiled water to make a paste that you apply on the burn. But in an extreme case as in the picture of the hand and arm, it is way past the Gumbo Limbo power! You are now dealing with 1st or 2nd degree burns and believe me, it is atrocious. Medicated, anti-itch first aid cream helps relieve the burning and itching and also helps keeping the infection down. And in some cases, as in my husband’s, antibiotics and a steroid medication are in order! I myself used a Sunburn Relief Gel with lidocaine, tea tree oil and aloe vera and it was very soothing and cooling! One more trick… if you are going to cut or handle Black Poisonwood, apply the Gumbo Limbo to your face, hands and arms before you start. This will provide a good protection as it prevents the sap to stick to your skin. Obviously, we learned that ‘after’ we had to deal with those trees! Not a lesson that we will soon forget! And due to the high risk in harvesting this wood, it is pricey. Hey, maybe we are sitting on a gold mine here? This is the first time I am reading about this tree. Amazing truth.Truly informative. Gosh, there must be some awful poisonous irritant in that tree sap. Are these trees only found in that region where you are or are these trees also in other parts of the World? Strange that the locals did not advise your hubbie and you about the danger of this tree sap when it contacts the human skin. thanks for the info. never heard of this tree. Was walking through a remote island in the bahamas and me and a few friends came down with blistering rashes. Diagnosed with the help of your info. Ended up getting some treatment once we reached a medical clinic. Munson Island and it is there as well. All the boy scouts on that island are told and warned about this tree. Very nasty! Besides Central America and the Caribbean, I don’t know where else this tree might be found. But I would think in other sub-tropical jungle regions they might exist. We knew about them as we’ve had very small burns before. It was not much and was treated quickly. But that last time was another story!!! How you diddly doing. Long time no speak. Without the right knowledge, they can also be a death trap. This is my first time visiting tropicat.wordpress.com and i must say i like it a lot. Your article was an educationa read. I will definetly come back here more often! Try “tednu Calagel” worked unbelievable wonders for me-run don’t walk to your nearest pharmacy! I wish you all the luck you can get and I hope you heal as fast as possible. I know that a common treatment prescribed by doctors in Belize is Steroid. My husband was on that for 5 weeks. I believe the name was Prednisone. You might want to ask your doctor about this treatment. At least you don’t have any blackpoison wood tree around you! As for time line, since you have it bad, it might take a while… 4 to 6 weeks? From the news, GT and Provo got hit pretty bad. But Haiti is in real bad shape, and now poor Cuba being hit by Ike. Looks like a tough season for the Caribbean this year. 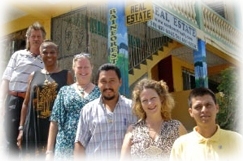 Have read your postings on Belize Forum in the past and was glad to find this article. Believe me I wish I had read it before climbing into the brush behind my house on Caye Caulker with a saw to remove a tree blocking my breeze. Climbed up that sucker and took it down in pieces. It is now taking me down in pieces. Do not look as bad as the photos with with posting, but it could get worse. Back in the states now and treating the rash and blisters as best I can. Hope that I have begun treatment in time. Ouch! I will have to wear a beekeeper outfit b/c if there’s a tree like that you can bet my big behind will find it. LOL! Filing these page for future use. Husband and I living on Providenciales, Turks & Caicos. Had no idea there was such a thing and never imagined such a thing. At first he thought he had been bitten by mosquitos which for some reason had not bitten me which was a miracle. The next day he came home the the spots were getting really bad. Day 2 he asked a local/belonger if there was poison oak or ivy on the island, he said yes poison. Now thanks to your website I know exactly what he got into and what to look out for. We both love going out into the brush and getting plants to plant in our yard never thinking any of them would be harmful. Thanks again for so much great information. Sometimes people can develop a contact allergy to oil and diesel fuel. Had a friend who worked in a fuel lab who looked like that if he wasn’t careful about his gloves. Thank you for the very clear documentation on poisonwood and gumbo limbo. After 4 horrendous attacks of dermatitis, your site has finally helped me to identify the cause and also let me find out that I even have the cure growing on my yard. My arm looked exactly like the picture of your hand! I’ve lived in S. FL since 1952 and have never heard about poisonwood until today. I had my first bout with poison ivy in Pompano Bch in ’72 and it turned into 3rd degree-like burns. Come to find out, though, my youngest son who is 22 is never bothered by poison ivy. 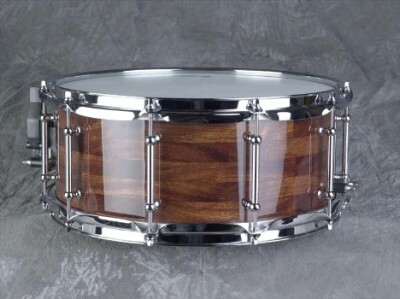 of the wood as in the drum that you showed that was made from it. If I choose to harvest this one tree, I will use extreme caution. Another plant your readers need to hear about is the Agave (or Century Plant). I transplanted a huge one in Brunswick, GA and made the mistake of cutting off the lower branches with a chainsaw and the sap sprayed my arms and it immediately started burning like fire. Because of my bouts with poison ivy I ran to my truck to get my Dawn dish detergent to wash with it, but it did not help at all. I recommend if you have to fool with this plant wear long sleeves, gloves, and USE A HAND SAW NOT A CHAINSAW, so the spray doesn’t get on you. Thank you for your story, and for adding some information about other dangerous trees and tips to protect yourself. As always, Mother Nature has to be feared sometimes, and we must respect her as we never know what’s in store for us! Thanks for this great info. I sure hope those who read my post will get to read your comment as it is most informative! I’ve noticed the same thing. Any wetness that is not accompanied by Dawn dish liquid spreads the oil. Swim in the pool, spread the oil. Wash in Gumbo Limbo, spread the oil. Every time I’ve had this it has taken over a month to clear. Every effort to eliminate it, makes it spread; except for dawn dish liquid. It’s truly the only remedy I’ve seen. However, it does work great. This last time I had it I would wash it once every evening by scrubbing with dawn. It would burn for about an hour afterward but would not itch for hours. And it did not spread near as much as the first time when I used Gumbo Limbo. It seems though that the body multiplies the toxins because no matter how much I wash it, it is still contagious. I’m at the end of it on my arms now and I went in the pool thinking I’d be okay. Apparently some oil dripped on my foot and I’ve got another round of blisters to get over there. At least I can wear socks to keep it from spreading. (patoi for black poisonwood tree). One jamaican doctor gave me a wrong medication. I called my friend (skin doctor) in germany and he gave me the best clue. Thanks for the tip. So many people catch it and don’t know what to do. This post is read a lot and the more people leave tips the better it helps others! I checked out your web page… If I ever go to Jamaica for a visit (I lived in Runaway Bay and Negril) I will definitely stop by! I have had two cases of poisonwood in the last 5 years. My U.S. dermatologist researched it and prescribed Emboline-E cream, which was a miracle! I have never heard of that cream. Thanks for sharing, it might help other people looking for some cure and stumbling on this post! I am just beginning to feel some relief from my encounter with a Black Poisonwood tree two weeks ago on Harbour Island in the Bahamas. I had no idea what those tiny tar like marks on my arm were and I tried to rub them off. You can probably guess what happened next. A few days later, back in the states, I developed incredibly painful blisters. I made some phone calls and figured out that it was contact dermatitis from the poison wood tree. What a painful ordeal! The first blisters appeared 3-4 days after exposure and new blisters continued to appear and spread. After a trip to the ER (it was a Sunday, of course) and a painful scrub down with a surgical scrub kit I learned you must thoroughly (aggressively) remove the toxin to inhibit its spread. Here’s what helped me–benadryl every 4-6 hours, 5 day steroid treatment and oatmeal poultice or aloe vera gel (straight from the large plant in my den) as needed. I will almost certainly have scars and I will never never, ever touch a tree in tropics that looks anything like the Poisonwood tree. Yep, getting through is quite an ordeal… but I doubt you’ll have scars. My husband had almost his entire body covered, it was really really bad, and he has no scars. can also become contaminated with the toxin and cause the spreading of the blisters on the skin? Indeed, live in kind of studio room so soon after contact I just wash my hands with soap and hot water and went inside my room to change myself.I just put the clothes on the sofa where other washed clothes lay by and since then blisters keep going and coming all over my legs ,arms and torso. Albeit I have washed the clothes, the canvas is still in the room which serves as both my living and bed room. Am I really living within a mist of the toxin? Plwase help, I am an albino with already sensitive skin. I have already gone to see my GP who prescribed some antibiotics and some white cream. I have just finished taking all the 21 caps and still applying the cream and yet the blisters keep coming and going. Your clothing should be soaked in a substance like “paint thinner”. The black poison wood toxin is hard to dissolve and soap won’t do it. For the “infection” to run its course it will take a while (easily up to a month). I have never heard of this cream, buy maybe check with your Dr to give it a try. Happy new leap year to you and your kith and kin ,Tropicat and a fulfilling one at that. Many thanks for the reply and endeavour I shall and see how it goes with me; I mean the suggested remedies. I recently came in contact with poisonwood, and I looked like the photo in this blog. I was in a terrible agonizing itchie state with blistering weeping rash all over my arms, chest and belly. I was getting very little sleep. After 4 days I was nearly in panic mode. I was miserable. Finally I prayed to God, and went into Key West, looking for a miracle cure. Well I found one at the Publix pharmacy.The pharmasist there insisted I try this product. He has treated lots of people everyday down here in the Florida Keys, where there are a lot of stupid Canadians like me, that just don’t know! The product is called Zanfel. If you have come in contact with poisonwood, (or similar) YOU HAVE TO BUY THIS PRODUCT!!! It WORKS. Just follow the 5 steps and within 1 minute I was free of the itching and burning, and I had it BAD ! Its not cheap, it was $39.99 for a 1 ounce tube , and I almost did not buy it, but I am so happy I did. I am now on day 5 and sleeping well. No itch, no burn and my rash is now going away. None of this 5 week stuff for me! I thank God and Zanfel, you need to try both! That’s great you found something that works, and thanks for sharing with us. Hopefully it will help others! Our family just returned from vacationing in Mexican Riveria and took a guided tour of the Tulum ruins. The next day our 14 yr old son starting breaking out in a rash all over his face! By the next day we were in a Mexican emergency room and the doctors there didn’t even know what it was! I told them it resembled what we have here in the states like poison sumac. They gave him an iv with anti histomine and a steroid. Next morning his eyes were swollen shut and looked even worse! We were due to leave that day so needless to say it was a LONG day of travel for him but as soon as we landed we went straight to ER and they got him on prednisone. I’m using benedhryl and cortizone cream also. He’s been miserable! Wasn’t until our very last day a local from the restaurant we were at said it appeared to be from the Che chen tree. Is that the same as the poison wood tree your talking about? Thanks for the info. I’m printing out pictures of both trees so now IF we return (he says he’s NEVER going back!) we will know what to stay away from and what to look for for the cure! I had the poisonwood blisters and pain too when we were exploiring the beautiful islands of the Bahamas and my Australian friend told me that once you have the poison in your body it will keep coming back – and he was right it came back some 15 years later and it was rather nasty: very itchy all over my arms, my back and chest and it was like moving under my skin. Now, some 20 years later I have the same experience again – not itching, but just pure pain creeping over my body – took some days. No receipe – just let it work out. I have a question about the rash this black sap leaves on you once you came in contact with this unforgiving sap. The question I have is it possible for this sap to leave a scar that covers the whole length of the inside forearm ? The reason I ask us because I came in contact with this sap while working with a tree company and no body working had no idea of the dangers of this tree, not even the boss and owner of the company. The sap dripped on my skin and turned black and was left unattended for the entire work day which was almost 10 hours before my shower and calamine lotion. I did not realize that I made contact with this tree until after a week of having it by reading your web page about this tree. Thank you very much for your time and knowledge. I don’t know for sure if it can leave a scar, but the burn can be so severe that I would not be surprised if it does. Emboline is a prescription cream that works fabulously for poisonwood. We live in the Bahamas and can vouch for this med! If you start getting the “pimples” and itching, scrub the area hard to break the pimple and wash/rinse with soap, WD-40, or gasoline, ( right after contact) then rinse with water. Then apply the Emboline liberally. It may take a day or 2 but it won’t spread. Poisonwood WILL scar you, as my wife found out unhappily. She will cover the area with Emboline and a bandaid or dressing to keep it from contacting other areas and it seems to prevent spreading. Best to learn to recognize the tree but even the windblown leaves can pose a hazard. I had two encounters of the rash on two separate visits to tiny villages outside of Cancun. We were chopping down trees to build a church and our translator warned us about them! He called it the Chechen tree and also mentioned that there was an antidote tree that grew next to each of the chechen trees, but I never knew it was the gumbo limbo tree! It was too difficult for us to tell the difference between the trees though and I ended up coming in contact with the sap the first time. The results were horrendous. The second time I thought I had learned my lesson and stayed away from where they were cutting down the trees, but somehow, whether airborne or via contact with someone else who had the sap on them, I contracted the rash AGAIN. It was so, so terrible! Ever since then I have been trying to find out more info with almost no results. The curious thing is that ever since then, even though I live far away from any Chechen trees now, I still have tiny outbreaks of the rash between my fingers about every few months. I thought I was mistakenly identifying the small outbreaks, but then a few months ago a friend who contracted the rash on the same trip as I did contacted me and asked me if I had random outbreaks of the rash too!!! It is the weirdest thing! Does your husband ever have this? Thanks for posting your experience and the info about the tree! I have a property in the Abacos that has a lot of black poisonwood trees. After I cut them down, what is the best method to kill the residual roots so the plant won’t live. Appreciate any info. Yes, I know either killing the roots or removing it are solutions. I’m wondering if dosing the roots with “Round-up” or other herbicide might do the trick. Anyone tried this? I have drilled it on downward angle and kept filling it with Round UP and it finally killed it but–as i later found the sawdust from cutting it down is still toxic.–“tecnu Calgel” is unbelievable on treating itch.Run , don’t walk to your pharmacy-it is on the shelves. Great article! Thank you for sharing….especially with the pics! Extremely interesting and very informative. Thanks for your insight! Thank you for sharing this information. I just returned from a trip in the Yucatan and my arms look like your pictures! I thought I had been bitten by a bug, but I do remember the black tar-like sap on my arms. What a horrible experience! It is somewaht comforting to know what it is, though! The doctor has me on antibiotics and a topical antibiotic and an antihistamine. But it feels like the rash is still spreading, just not as extreme. I might need to go find some Zanfel like one person mentioned. I’m not encouraged to hear it can come back in the future. I am unfortunately very familiar with this tree. Trust me it’s bad. I wish I could post pictures of the burns on the inside of my arms, ugg. I had to take a one week oral dose of Prednisone. I have a lot of Poisonwood on my property in the Bahamas. We are now trying to erradicate it. It readily propogates on it’s own from the fallen berries. I too have heard from the locals here that gasoline, diesel fuel, or other petroleum based products. It makes sense that WD40 would also work. I’ve used acetone. They key is using the solvent as soon as possible after suspicion of contact. I have one largish tree that if I had the means Iwould try to harvest the lumber, but I’ll probably just end up trashing it. I wish you luck with your burns. To harvest the lumber, it would be nice as it is beautiful wood. But… it’s pretty dangerous!